Occasionally I surf Kijiji for buys; but, just yesterday, the images of the items for sale stopped showing. I was messing around with Autoruns and some other features on the site (Kijiji) and may have somehow disabled them; but I can't figure what I did, if anything. Other sites show images normally, and Firefox shows Kijiji's images, so it seems like it's specific to this site. shakushinnen wrote: I was messing around with Autoruns and some other features on the site (Kijiji) and may have somehow disabled them; but I can't figure what I did, if anything. ... and make sure default action is "Allow". Check your adblocker for such URLs. My permissions is exactly like the example above, except that my cookies is set to accept. shakushinnen wrote: [...] except that my cookies is set to accept. Clear cookies for this site and check again. Can you see pictures on this page? How about direct link to picture? I don't want to register there so I can't check account possible settings. Try to log off, clear cookies, check pictures without logging in, log in and check again. I did not see any images on the first site, but I did see the Mustang in the jpg link. "Looks like this site is your nemesis or something ..."
Yes, it does seem so; but it must be related to SeaMonkey, since Firefox shows it fine. 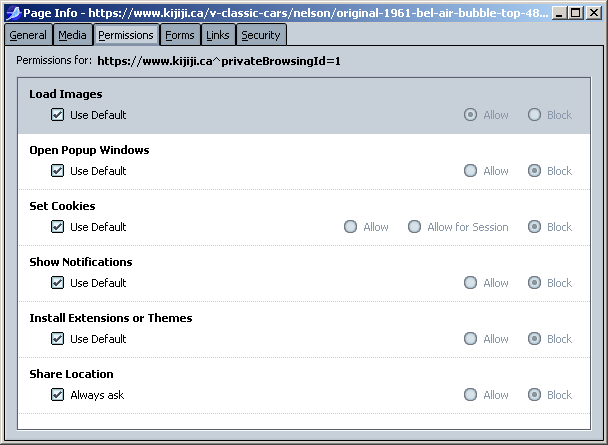 I was in touch with the Kijiji's technical service; and they sent me a shortcut to a site that will read the settings on my computer. I'm a little reluctant to send this information to them, for reasons you may understand. Here's what he said, including the shortcut. Please let me know if you think this information will help to solve my problem. Go on and visit above website. "This is a best-guess attempt at working out what browser/system configuration your user/client/customer has. We hope it helped." It can't "read" your system. Such report is based on your browser's User Agent and its behavior. ... then they already knows it. 3) if works then install Adblock Plus and import filters from you old profile (which means you must export it first). 4) if works then you messed up something with SM settings in your old profile. If you have 3rd-party software like AV/Security with webcontent filtering then check their settings. Last edited by shakushinnen on April 28th, 2018, 11:25 am, edited 1 time in total. Well, yes you can make default settings for your old profile. Simply delete "prefs.js" file. It contains all your settings... but cookies, bookmarks, passwords, URL history and others not so important things. "Prefs.js" will be recreated with default settings. Just make sure SeaMonkey is not running. Restoring just "prefs.js" can't guarantee everything will be correct as before. Menu -> Help -> Troubleshooting Information -> scroll down to section "Important Modified Preferences"
Maybe you'll see something that will help you solve your problem in "safe way". DO NOT copy "prefs.js" between different profiles. Just delete old one and it will be restored brand new (like for new profile). You can copy entire folder with old profile if you want... but one file archive can be your backup copy easily moved to external drive (e.g. flash). Your call. After talking to you I remembered that I have Mozbackup; so I used that to back up my 'problem' installation, then deleted prefs.js from the active version of it. But when I restarted it and went to Kijiji I still did not have images. Strange. I notice that Mozbackup allows me select what I keep of an installation, so maybe we can use that to edit out the problem child. What do you think? MozBackup is obsolete, not developed since 2012. I had problems when I tried to restore profile (some files was skipped even when I selected full backup). Since then I'm using file archivers (now: 7-Zip) to do full copy of SeaMonkey folder with profiles. It is much safer. You can copy it to other location but remember to not delete/move something from such copy. If deleting "prefs.js" from old profile didn't help then it means problem is not in "plain" settings but with e.g. cookies (saved in "cookies.sqlite" file). You need to find what did you do with setting/preferences/cookies for this particular site (Kijiji). OK. Thanks for the heads up about Mozback. I didn't realize it has problems. It restored this time, so I guess I got lucky. I'll try to figure out what I did to cause the problem.